WASHINGTON — Lt. Gen. Patricia McQuistion, deputy commanding general of Army Materiel Command, took questions from Army personnel, industry and academia during a panel discussion at the annual meeting of the Association of the United States Army Oct. 22. The first question addressed to McQuistion was how the Organic Industrial Base and readiness were impacted by sequestration and the Budget Control Act. “In January 2013, we were told to cancel all third and fourth quarter depot operations and this caused delays in many of our efforts. We had to redirect work to depots and arsenals that did not have as much work,” said McQuistion. “It placed havoc on our ability to plan and work effectively, and it caused an increase the rates we have to charge our customers,” she stated. In terms of reset and the lack of Oversees Contingency Operations funding, AMC reset less equipment after the Budget Control Act and Sequestration. Using aviation as an example, AMC reset 111 fewer aircrafts than originally planned for; the rest were shifted to fiscal year 2014, McQuistion explained. “On the tactical side, the ability for Soldiers to order parts and receive them affected readiness,” she continued. And then AMC had to furlough the workforce at the depots and arsenals; yet the workforce was still able to reset all of the aircraft needed for combat, she added. McQuistion also noted the importance of revitalization of the infrastructure at Organic Industrial Bases, many of which are in need of repairs. “We do have to commit to the revitalization of the OIB,” she stated frankly. Other questions from the audience revolved around science and technology and integrating industry’s platforms to the Army, and policy issues tangled in creating a Program of Record. McQuistion cited the Army’s Mobile Parts Hospital as an example of taking an industry principal and applying it to the Army. The Army’s Mobile Parts Hospital provides treatment to a vehicle by being able to create a fully dense metal automotive part, replacing a broken part while in the field. To the Soldier this means there is no longer a need to wait weeks to have a part fixed on a vehicle, but a matter of hours. 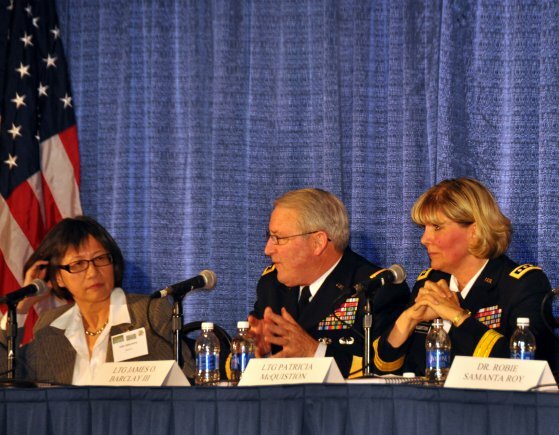 The panel was hosted by Heidi Shyu, Assistant Secretary of the Army for Acquisition, Logistics and Technology. Other panelists were Lt. Gen. James O. Barclay III, deputy chief of staff, G-8; Dr. Robie Samanta Roy, professional staff member for the Senate Armed Services Committee; Kevin Gates, professional staff member for the House Armed Services Committee; Angela Messer, executive vice president of Booz Allen Hamilton; and Johnny Barnes, vice president of Intelligence at IBM.